I have no idea what was up with the post office full of kiwi fruit. 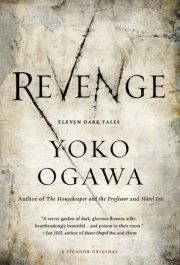 Yoko Ogawa’s collection Revenge was first published in 1998 as Kamoku na shigai, Midara na tomurai. Under the current title it was made available in English in 2013 by Picador. Revenge includes eleven macabre short stories. The collection is not long but it is very good.